Creative decoration with flowers, beads and pearls. Gives it beautiful lovely look. Customised ring trays for the engagement ceremony. Choose from our designs, or get one personlised according to your theme, bride’s dress or choice of colours and materials. The wedding ring tray accentuates the brilliance and beauty of the rings that would be exchanged. Also available as pairs. This is a hand crafted Engagement Ring Tray with beautiful flower and statues that makes antique look of this ring platter. This is used for wedding ring ceremory. 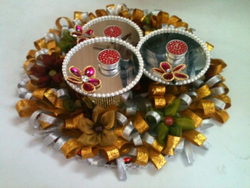 we are designer and supplyer of such type of gifts. - An elegant looking Tray which can be used for engagement purposes on the occassion . - Things put in this tray will have an extra appeal due to its shiny color. - It can be used to place rings in the ring box provided and can be placed at the centre of the ceremony table. - Materiyal : Wood Sheet, Decoretive Beads, Fancy Febric & lace, Ring dabbi all materiyal use in best finising Oval Ring Ceremony Tray. - Use : Specially used during ring ceremony to put finger ring inside in INDIAN WEDDINGS. - Size : 9"X8" INCHES (approx). 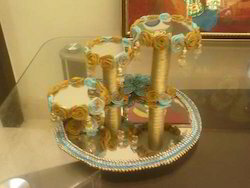 Inspired by the balcony love scene of romeo julliet, Blue green engagement tray in house shape. for single or dual rings. Ring Ceremony Tray can be customizable. Rose Ring tray is decoreted with Pearl and Rose.Your Engagement Ring placed on this will brighten the ceremony.1: Size 14" round2: Color Red3: Price 1250.00 plus shipping charges 4: Type Couple5: Packing with bubble sheetYou can customize your product according to Single or Couple, color and size. For national and international orders shipping charges as applicable.